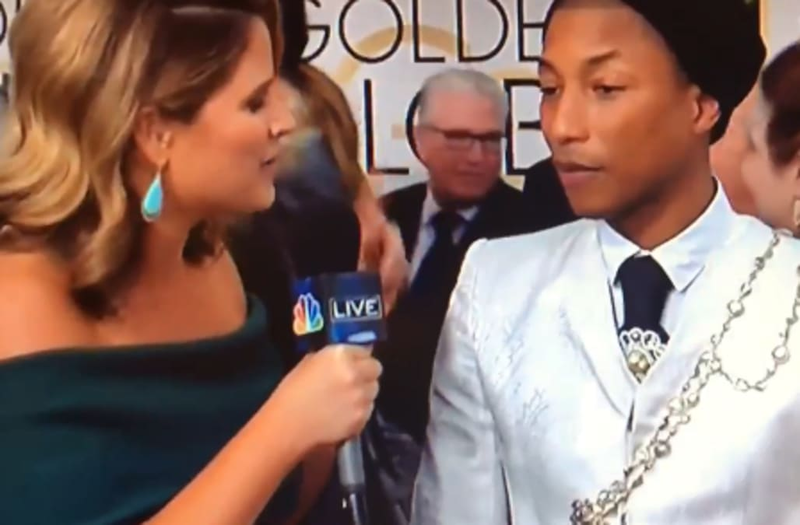 Jenna Bush Hager suffered a major blunder on the Golden Globes 2017 red carpet when talking to nominee Pharrell Williams. "You're nominated for 'Hidden Fences,'" Bush Hager proclaimed when talking to a wide-eyed Williams, mixing up the titles of "Hidden Figures" and "Fences," two films that are big players in award season this year. Almost immediately, viewers took to Twitter to call attention to the gaffe and noted the racial undertones of the mixup -- both "Fences" and "Hidden Figures" feature largely Black actors. "Fences" stars Viola Davis and Denzel Washington, while "Hidden Figures" stars Taraji P. Henson, Octavia Spencer and Janelle Monae. I'm surprised Jenna Bush didn't tell Pharrell how great she thought he was in both "Roots" and "Star Trek: the Next Generation". Williams didn't vocally react to her blunder, but his facial expression did all of the talking. Bush Hager, who was covering her first-ever Golden Globes red carpet for NBC, didn't appear to notice that she had made the mixup. Pharrell is, in fact, nominated for "Hidden Figures" -- not "Fences" -- for Best Original Score.